Here is CW at thirteen hours. I love the colors in this pattern. The slate blues are wonderful. I stitched for an hour tonight while I watched Survivor. Cross stitch and mindless television go wonderful together. 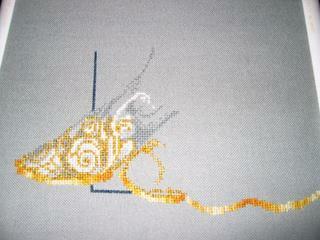 i got a fair bit more gold and part of the border done today. I can’t wait to see what the next few hours of stitching on CW will bring. Now I have to wait for Allen to get home so we can watch CSI together. I am very impatient and want to watch it NOW!!! I am also excited because my first FOTM from silkweaver was shipped today. I signed up for two pieces of standard colors of fabric, but after seeing the Solo Carol got recently, I may have to do one of their hand-dyed options as well. Up until recently, I have not been adventerous enough to stitch on much beyond neutral tone fabric. As I see more and more people using unique fabrics, I am beginning to feel more comfortable with how well it can turn out. Hopefully I will get something that will look good with one of my future projects. Another fun suggestion from Nicki. Lady, you are the bomb! If anyone has suggestions for the future, please let me know. Are abridged books a good thing or just plain awful? I am not particularly fond of abriged versions of the book. I think you end up missing a lot. How about books that are edited to modernize them? I think that it is okay for later authors to write their own modernized versions of the same story, but I am not sure about editing the original text to modernize it. I think that is what movies are for. Is dated language part of the charm of a book or an irritation? Althoug it can take longer to read, I do enjoy reading books in their original language. I read the original version of Canterbury Tales which was a lot of fun. Have you ever read an abridged or edited version of a book? I don’t think so. « 11:20PM Here is my progress on WF after 30 hours…. Your CW is looking really good – great idea starting at the bottom where all swirly bits are! CW is looking great! I am looking forward to see the progress on her.